This beautiful bridal set by Perfect Fit. Expertly crafted from 9ct white gold, this glamorous set features a sparkling engagement ring showcasing dazzling diamonds. Set in a twist design finished with stylish rose gold accents, this gorgeous ring perfectly accompanies a simple & elegant wedding band to form a truly special set. 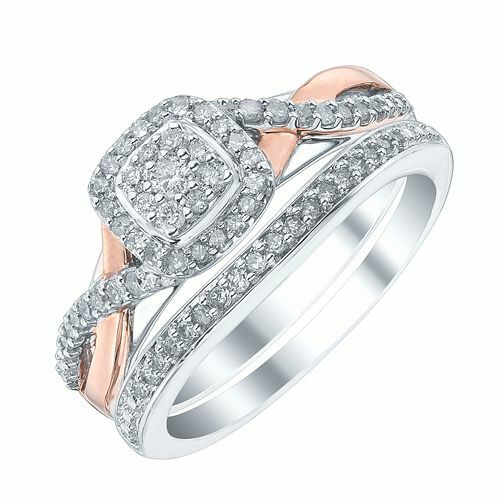 9ct White & Rose Gold 1/3ct Diamond Perfect Fit Bridal Set is rated 4.7 out of 5 by 7. Rated 5 out of 5 by Anonymous from Gorgeous set of rings! Beautiful set of rings, perfect for engagement and wedding.